Soft Skull Press, 9781593765156, 248pp. I haven't tasted chocolate for over ten years and now I'm walking down the street unwrapping a Kit Kat. Remember when Kate Moss said, 'Nothing tastes as good as skinny feels'? She's wrong: chocolate does. For Christmas I'm giving myself a fresh start. I have to get some extra pounds of weight under my belt; I want to make next year the year that everything changes. At the age of 32, after ten years of hiding from the truth, Emma Woolf finally decided it was time to face the biggest challenge of her life. Addicted to hunger, exercise and control, she was juggling a full-blown eating disorder with a successful career, functioning on an apple a day. Having met the man of her dreams (and wanting a future and a baby together), she decided it was time to stop starving and start living. And as if that wasn't enough pressure, Emma also agreed to chart her progress in a weekly column for The Times. Honest, hard-hitting and yet romantic, An Apple a Day is a manifesto for the modern generation to stop starving and start living. 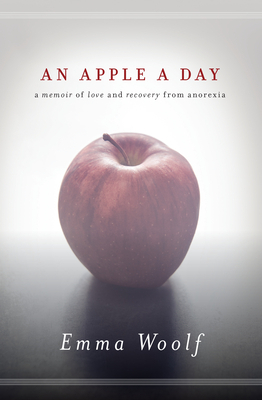 This compelling, life-affirming true story is essential reading for anyone affected by eating disorders (whether as a sufferer or ally), anyone interested in health and social issues - and for medical and health professionals. Born and brought up in London, Emma Woolf studied English at Oxford University. She worked in Psychology publishing for ten years before becoming a freelance journalist and writer, contributing to The Independent, The Times, The Mail on Sunday, Harper's Bazaar, Grazia, Red and Psychologies. Emma's weekly 'An Apple a Day' column in The Times is one of the newspaper's most popular features, with thousands of followers on-line. Emma has made numerous media appearances to discuss body image and eating disorders - most recently on Channel 5 News, Radio 4 Woman's Hour and LBC Book Club - and also consults for BEAT, the National Eating Disorders Association.